Durlston Castle and Country Park is the ideal location for your function, whether it be your wedding, a family gathering or a party, we can cater for your needs. Let the Castle be the stunning backdrop to your event, with the Gallery for larger functions and the Belvedere for more intimate gatherings the choice is yours. Both the Belvedere and the Gallery are available for private hire, please contact a Ranger or email us at durlston@dorsetcc.gov.uk for further details. The Belvedere room is the ideal venue to wow your guests with sea views on three sides and the woodland treetops on the other. Whether it be a board meeting, a drinks party, a Knight In Shining Armour or Princess Party, being on top of the Castle is bound to impress. Hire of the Belvedere includes tables and blue chairs, and can include dry wipe board and flip chart if requested in advance. Access to the roof is permitted but not exclusive. Exclusive use of the roof can be requested for an additional fee at the same rates as room hire. Please note that the prices below are for private hire and not for wedding hire due to the cost of licensing the building as a wedding ceremony venue - all weddings must be booked through the wedding planner and are subject to a separate price structure. 2 hour £105, 3 hour £150, 4 hour £195, all day £350 (10am – Castle close: 4 or 5pm). Evening hire £350 (6pm – 10pm), capacity of 50. Thinking of a venue to host your anniversary or office party, your AGM or shareholders meeting? The Gallery can host it with style and panache. 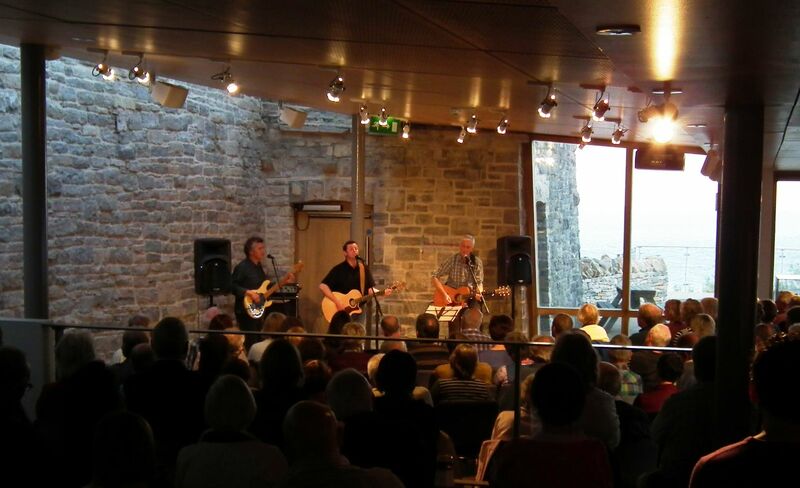 The venue regularly plays host to music concerts, comedy gigs and lectures so if you are looking for somewhere rather special to host your night, make us your first port of call. Hire include tables and chairs, screen, sound system, projector and bar if required. Limited availability, contact us for availability and prices. Capacity 150 theatre style, 90 seated for food (including the Cinema room). The café/restaurant can be booked for private events, please speak to a member of Seventhwave’s staff for details or email seventhwaverestaurant@gmail.com Capacity 55 seated at tables. The Learning Centre activities room is an ideal space for meetings, children’s parties or talks. The room is equipped with a digital whiteboard, projector and speakers. Morning £35 (9am – 1pm), afternoon £35 (1pm – 5pm), evening £100 (6pm – 10pm). Community group discount rates (£25/£25/£60), capacity 60 theatre style seating.